Nick Ray: 2014 – DAY 2 … bread, pasta and the besto! A different kind of challenge today confronted me as ‘the machines took over!’. A hiccup with our anti-spam software meant some people couldn’t blog (me included). And then the realisation that I’d left the camera charger in the country and so was without the means to take pics today, meant a rather somber beginning to Day 2. However, nothing like some sunny-side-up, delicious own-chook eggs to cheer one up! We’re lucky to find these, as the 4 chooks we have recently found a hole to access under the house and the pile of eggs that should be warming my insides in quietly rotting in the darkness. (zero kms). Fried in butter that Janet and Max had hand-churned. 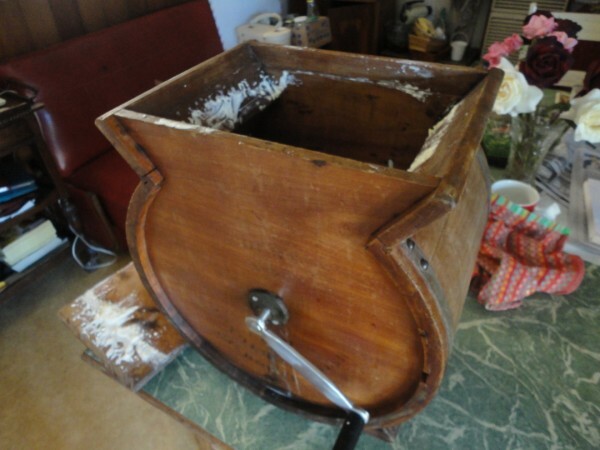 She’d found an old butter churn at an opp-shop – it leaked but my dad restored it and now works a marvel. 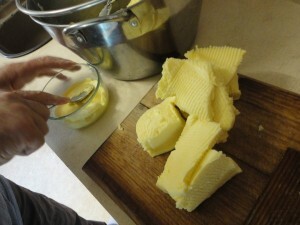 We used regular Pura milk, so not sure exactly where it came from.where the milk for this particular butter came from. To complement, I made up some ‘rock cakes’ – not as bad as they sound. Spelt four from Powlett Hill (see below), with sunflower seeds from Four Leaf Milling, Tarlee, SA (772kms), water and salt. Flattened, then cooked under the griller. Hmmm… somewhat tasty. Lunch. A trip to Seddon saw a Casalinga loaf from Sough dough bakery. The only info they had on the flour was that it was from the Wholegrain Milling Company in Gunnedah NSW. Also my favourite Meredith Goats cheese (104kms), and bananas. What bananas??? Yes, a school holiday special request. Bought from Pompello Fruit shop, sourced direct from Coffs Harbour, NSW (1,400kms)… no banana republic imports here! These went together with tomatoes and lettuce from the WOC box. – likely to be from Yellow Box Farm Organics in Hildene near Seymour (109kms), and Ladybird Organics in Keilor (20kms) respectively – making a totally tasty sandwich feast. And orange juice to top it off, hand squeezed, the last of the summer Valencia oranges from Mildura region, Victoria (542kms). Dinner – A meal with my parents, come to visit the kids. Our equivalent to an ‘easy-cook packet meal’. Two quick ‘n delicious options! Biodynamic Spelt pasta – Spelt from Powlet Hill, Campbelltown, Vic (137kms). The Fawcett family have farmed this area since 1861. Andrew and son Ben grow Biodynamic grains and sheep on 3000 acres. Pastas are made for them by Casalare Specialty Pastas in Kyabram. I buy it through our Dry Goods component of the WOC food coop. The coop sources it from wholesalers Biodynamic Marketing, based in Powelltown. Pesto sauce – It’s the besto! – Mostly made from produce from weekly WOC box or quarterly Dry Goods order. Basil (L’herbier, Fingal, Vic – 104 kms), olive oil (Mt Zero, Laharum, Vic – 286 kms), and salt. (Pink Lake Salt, Dimboola, Vic – 326 kms), and cashews instead of pine nuts. Cashews and pine nuts are not cultivated in Australia on a commercial scale (source). The cashew tree grows in the tropics and subtropics requiring high humidity and fertile soil. Australia imports cashews primarily from Vietnam (83%) and India (14%). I found that … “Currently there is only one commercial cashew farm in Australia. It’s owned by Cashews Australia and is located at Dimbulah in northern Queensland. The farm has recently much expanded from the initial 240 ha property. See the ABC Landline (March 2011)”. … However the cashews in this pesto come from Eco Farms, origin Vietnam (about 6,700 kms). Bolognaise sauce – Janet’s sauce made from tomatoes from the Footscray market (not sure the source) and mince meat from the Wembley Avenue Meat, in Yarraville.